By now you may have heard about the Ananda movie, “Finding Happiness.” Filming concluded in October 2012, and post-production is nearly complete. Those who have seen the “director’s cut” say that it’s fabulous. The grand premiere is at Ananda Village on July 26, 2013. And yes, Ananda Yoga plays a role! Here’s the plot: The global economic crisis and widespread political unrest spurs an investigative journalist to seek nonconventional solutions to modern problems. She finds Ananda, and the movie becomes a docudrama about her investigation of Ananda Village. The intention is to inspire people with the possibilities offered by small, intentional communities. Yogananda’s great grand-nephew Sujon played the part of Yogananda in the famous 1949 Beverly Hills garden party, at which Yogananda sowed “in the ether” the thought of spiritual communities. The budget is tiny, as movies go: only about 30 days of filming, minimal set costs (Ananda is the set), wardrobe by our own Maghi Weber, and almost everyone in the movie lives in an Ananda community. The only professional actor with a significant role Elizabeth Rohm, who plays Juliet, the investigative reporter. The movie is being financed by private investors. We do, however, have a real Hollywood director, producer, and film crew of about 25 people. It was quite a scene each day: a small army descending upon the Village with trucks full of cameras, lights, reflectors, cranes, cables, crew members, sound equipment, makeup, generators, reflectors, train tracks for cameras to move on, and much more. The crew knew virtually nothing about Ananda before they arrived, but they loved working in the joyful, cooperative atmosphere. Right away they could feel that something very special is going on here. One of them said to me in wide-eyed enthusiasm, “I’ve gotten to see Swami Kriyananda for three days in a row!” A volunteer who used to work in the film industry remarked that if all movies were like this one, she never would have left the industry, which apparently is not always joyful and cooperative. And speaking of special, I greatly envied Elizabeth: the scene in which Swami Kriyananda blessed her had to be re-shot again and again — “about 100 times,” said Swamiji. I, too, had my big chance (hah!) at movie stardom: playing myself, I taught both Ananda Yoga and meditation to Juliet in what, after editing, will be at most 3–4 minutes of the movie. Gad! Ananda Yoga is not workout yoga; it’s work-in yoga: it’s about using the postures to go inside and uplift your consciousness. Each posture has a different effect on the flow of energy in your body, which in turn affects your state of mind. You weave them together to bring energy to the brain, so you can enter a state of calm, vibrant awareness, and expand your sense of who you are. Of course, body positions alone can’t do that. So in Ananda Yoga, we add the power of the mind. One way we do that is through affirmation. Each asana has its own affirmation, designed to amplify the natural effect of that physical position on your state of mind. As you hold the posture, repeat the affirmation silently, over and over, going ever deeper into that state of mind. 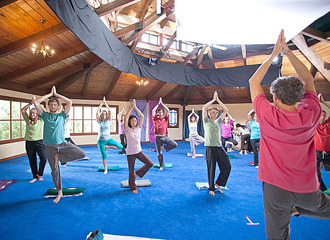 Ananda Yoga not about athleticism; there’s a version of the practice for anyone. And remember: effort is good, but strain will only diminish your experience. Then I taught and assisted Juliet in some asanas, which will appear in the movie as a montage (sequence of very brief video clips). We didn’t film the instructional part of the asanas; instead we focused on the feeling of Ananda Yoga, particularly the asana affirmations. After reviewing the clips, the director called them magical. Let’s hope. We — or rather, Elizabeth — did the asanas over and over until we got what the director wanted: the right camera angles, where to focus, what movements to make, when and how fast to move, when to zoom or move the camera, etc. Juliet paid a price for this: an aching body that was also highly asymmetric, since we did the same side of the two-sided asanas every time. I’d planned to use Bhujangasana, but Elizabeth wanted Ustrasana instead. She has a regular asana practice and is quite strong, so she could do it, but by her fifth or sixth intense Camel Pose, it was a lot less fun than she’d thought it would be! It’s a mixture of high energy and tedium. All thought of glamor fades quickly amid much waiting for changes of lighting and camera angles. At any given moment, at least several people are working intensely, but it’s usually not you. Then, when it’s go-time for you, things get very intense. It’s incredibly repetitive, with rehearsal upon rehearsal, followed by take upon re-take. I can only imagine what happens in big-budget movies, in which they reshoot scenes until they get them just right. The logistical details are staggering. Meticulous planning and organization are vital. Things rarely happen according to schedule. Stillness is to be avoided. Movement is essential, lest viewers get bored. Anyway, that’s the belief in the industry. I guess that’s why they’re called movies. We had to do Vrikasana over and over for rehearsals, then over and over for many takes — always on the same leg! The black fabric and white screen helped light the scene properly for the camera. A perfect example of this last point is the scene that led into my meeting with Juliet. It was the final moments of a yoga class that I (in my role) was teaching, as she arrived for a private class. The director insisted that I end the group class with Vrikasana — not meditation or deep relaxation. Gad yet again! “A standing pose looks better on camera,” he insisted, “plus it will enable the students to exit faster.” The class was, after all, just a lead-in to Juliet’s arrival, and he wanted the students to exit quickly. But wait, it gets worse: The scene begins with the students in Vrikasana. To save time — and to avoid stillness — there was no centering in Tadasana after Vrikasana. The director insisted that I dismiss the students while they were still coming out of the asana! When their arms were halfway down, I said something like “Good work, thank you” (read: “Scram!”). So when you see the movie, please don’t blame me for ending the class that way. The director says it will look fine in the movie. Let’s hope. I hope that it will inspire others to start communities — and ideally come to see a successful one firsthand. The world needs more small, intentional communities, not necessarily affiliated with Ananda. Even in good times, cities are huge disappointments compared to what’s possible in small communities — and in the hard times that seem inevitable, cities will be bleak places indeed. People need to see the potentials of a different way of life. For information on the movie, go to www.anandamovie.com. Click on “Trailers” to see a video clip that will give you a feel for the movie. Click on “Blog” to see several behind-the-scenes videos of the making of the movie. It’s been a fascinating adventure for all of us at Ananda, and I think it will be a a ray of hope for many people. I don’t know where it will lead us, but I’m sure of one thing: professional filmmaking is a different planet from life at Ananda Village. Unless God has other plans, I think I’ll stay on my own planet, thank you very much. This entry was posted in Yoga, Yoga Teacher Training and tagged Inspiration for Your Yoga Teaching, Yoga Teacher Short Stories. Bookmark the permalink. Dear Gyandev: Great article, I especially like your statement about Ananda yoga is not a work out yoga, its a work-in yoga and the poses lifting the consciousness. Glad you liked it, and thanks for the report on your teaching. Keep up your great service!